At a crime scene, we regularly find latex or vinyl gloves which have been left behind by the perpetrators. As crime scene officers, we are then confronted with the question of what to do with these gloves. We know these used gloves can contain fingerprints but how to make them visible? In most cases such gloves are secured only for DNA investigation. Sometimes there are attempts to make prints visible, usually with chemical methods, but as most of us probably have experienced, the results of chemical methods are usually not very satisfying. Usually perspiration and the powder in these gloves are blamed for having destroyed the latent fingerprints. 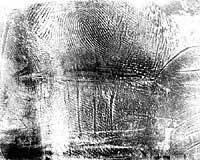 Up until 2001, I succeeded only once in my 30 years as a crime scene officer to visualize a fingerprint in a latex glove. I had tried many times to treat disposable latex and vinyl gloves with chemical means, but virtually all these attempts failed to produce a result. Then in the middle of 2001, a collegue handed me four latex gloves which had been thrown away by burglars when leaving a crime scene. As so often before, I started working on the gloves, treating two of them with ninhydrin and the others with cyanoacrylate fuming. Unfortunately, both methods failed to visualize any prints. After this disappointment, I wondered if it might be possible to get any fingerprints off of these gloves using a black gelatin lifter. With a piece of PVC tubing, stuck in the fingers of each glove, every finger was rolled ten 360° revolutions over a length of black Gellifter. To my amazement, a number of excellent prints were lifted from these chemically treated gloves. I had a strong suspicion that this could be a real breakthrough. Were these results with the four latex gloves a coincidence, or could it be that lifting prints with a Gellifter was the solution to a big problem? To get more certainty, I started a comparative examination, looking at all the methods that have been mentioned to visualize prints in gloves and at the lifting with the Gellifter. These methods gave varying results (see references). To research adequately, we needed first to nail down a few things. 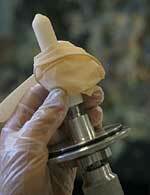 For example: what is the inside and what is the outside of a latex or vinyl disposable glove? How do you tell? Some people argue that the outside is always dirtier than the inside. Others assume that when a person pulls off these gloves, the inside automatically ends up on the outside. But what if the wearer of the gloves had dirty hands before he put on the gloves? Or if the sweat of the hands discolored the latex? Another question is: what is a left glove and what is a right glove? This last question cannot be answered by just looking at used gloves. However, we can determine with certainty the inside and the outside, provided the gloves have been worn only once. Carefully inspecting different brands of gloves showed that the cuff of the gloves is always manufactured in the same way. By inspecting the rolled bead cuff, or incising it in case of doubt, it is easy to see which side is which. 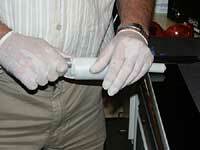 With an unused latex or vinyl glove, the bead is always rolled to the inside (see picture 1). Cutting through the bead reveals a spiral that shows how it was rolled. Having established this, we proceeded with comparative examination in three phases. Phase A - Performance of laboratory tests using chemical methods and gellifting singly and in various combinations on test marks made on disposable latex and vinyl gloves. The test marks were fingerprints placed by one person on the palm area of all the gloves, both the latex and vinyl, inside a circular outline (see picture 2). Some had a structured surface, similar to an orange. Some gloves were powdered and some were powder-free. Between test-marking and treatment, the test gloves were stored for 48 hours at a temperature of 24 °C and an air humidity of 45%. Phase B - Performance of laboratory tests on powdered gloves worn by nine different volunteers. The gloves had been worn during a normal work-day for a minimum period of 15 and a maximum of 70 minutes. The gloves were then stored six days at a temperature of 24 °C and an air humidity of around 40%. 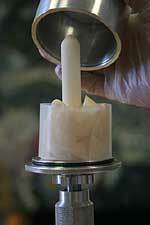 After the six days, the fingerprints were lifted by rolling, using strips of black BVDA Gellifters. No chemicals were applied before or after lifting. Phase C - Processing of evidentiary material: twelve used latex gloves, secured from a trash receptable in a hemp nursery. Not much can be said about the age of the marks, but they were at least 10 days old. A number of gloves were sticking to each other because of dirt. Test 1 - Ninhydrin: Treating finger marks on a powdered latex glove showed hardly any development of ridge detail. The latex, however, was discolored by the ninhydrin (picture 3). Test 1 - Lifting: After ninhydrin treatment, the test marks were lifted 6 times with a black gelatin lifter. The marks achieves their best at the sixth lift (see picture 4). Test 2 - CA and Rhodamine 6G: Powdered latex gloves were fumed with cyanoacrylate first and then treated with Rhodamine 6G solution. The marks did not fluoresce, but the surface of the latex glove did (see picture 5). 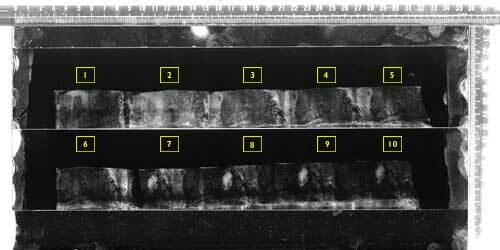 Test 2 - Lifting: The test area was processed 5 times with a black gelatin lifter and gave discernible prints each time, with increasing clarity (see picture 6). Test 3 - Cyanoacrylate: Powdered latex gloves were fumed with cyanoacrylate and without any fluorescent staining, lifted once with a black gelatin lifter (see picture 7). Test 3 - Lifting: After lifting an additional 5 times with a Gellifter, the residue of the powder and cyanoacrylate was gone and the prints clearly visible (see picture 8). 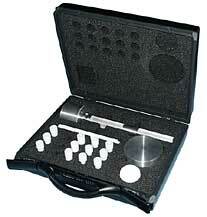 Test 4 - No chemical treatment; only lifter was used. Pictures 9 and 10 show the difference between the first and fifth lift with a black Gellifter. Test 5 - CA and Rhodamine 6G: Powder-free latex gloves were treated with cyanoacrylate and Rhodamine 6G, as in test 2. The developed prints were of low quality (see picture 11). Test 5 - Lifting: The prints were of good quality after the first lift and did not improve on subsequent lifts. Test 6 - No chemical treatment: The marks on powder-free latex disposable gloves were only processed with black gelatin lifters. Pictures 13 and 14 show the results of the first and second lift. Test 7 - No chemical treatment: The test prints on powdered vinyl gloves were processed only with the Gellifters. Remarkably, the color of the ridges changed from dark to light on subsequent lifts (picture 15 and 16). Test 8 - Gentian Violet Staining: A powdered latex glove was worn for 15 minutes and after 48 hours was treated with gentian violet. After rigorous rinsing with water, the gloves were left to dry naturally. On the index and middle finger, vague fingerprint ridges were visible, but less than suitable for identification (picture 17). Test 8 - Lifting: After lifting, highly evidentiary marks were recovered, as shown in picture 18. Ninhydrin, suitable for porous materials like paper and wood, is not suitable for developing prints on latex and vinyl disposable gloves. Cyanoacrylate builds up a residue on the latex and vinyl gloves and does not develop any prints. The residue add to the disturbance caused by the powder that can be present on the glove. Gentian violet stains not only fingerprints but also latex, which leads to a loss of contrast. Sticky-side powder actually destroyed the test marks and should therefore not to be used on latex and vinyl gloves. Iodine did not reveal any ridge detail, but did discolor the latex and vinyl gloves. The best results on the latex and vinyl gloves were obtained with gloves that, with no previous chemical treatment, were processed with black Gellifters. This second phase of the test came close to the conditions found in case work. The gloves (powdered latex gloves) were actually worn during work, and the search for latents was not started sooner than 6 days later. Because of the results from phase A, it was decided to not use chemical methods in Phase B, but only lifting with black Gellifters. Nine different persons took part in this phase of the research. From the 9 pairs of gloves, 90 fingers where rolled, and 59 of the 90 fingers yielded identifiable prints. From each glove one or more identifiable prints were recovered. In total, a 65% score was obtained. A number of lifted prints obtained from this phase of the investigation are depicted in pictures 19-26. This part of the research involved twelve powdered latex gloves that were secured from a hemp nursery after a raid in which no suspects were apprehended. The gloves were found in a trash receptable and had been used intensively. A number of gloves adhered to each other due to dirt (see picture 27). After all gloves were separated, the fingers were rolled on strips made out of black BVDA Gellifters. Despite the heavy use of the latex gloves and despite the fact that they were partially adhering to each other due to dirt, 8 identifiable fingerprints were lifted from these 12 gloves. 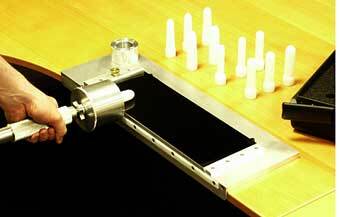 Fingerprints on vinyl or latex disposable gloves are best recovered by lifting with black BVDA gellifters. These fingerprints should not be pre-treated with a chemical method. Using this physical method, fingerprints can be lifted till about 10 days after the gloves have been worn, depending on the conditions at which they were kept. 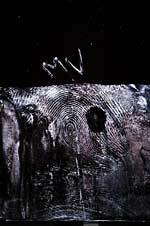 Somewhat older fingerprints (48 hours) give a better result than fresh marks, provided they have not been kept in extreme conditions. Due to the materials that are used in rolling the fingers, the lifted print is larger than an inked impression. In the palm area of the tested gloves, no identifiable ridge detail was found, probably due to the friction between glove and hand during wearing. The palm area of the glove is therefore ideally suited for securing DNA evidence. Methods other than lifting, like chemical treatments using cyanoacrylate, ninhydrin, DFO, iodine, sticky-side powder, and gentian violet, give mediocre to very bad results. With sticky-side powder, fingerprints on latex and vinyl gloves were totally destroyed. Because we cannot tell whether a glove has been worn on the left or right hand, we cannot lift only an area where ridge detail is expected. The fingers have therefore to be rolled 360 degrees, in a continuous movement, till at least 8 revolutions have been made. In most cases 3-6 revolutions were optimal. One can of course choose the best print for photography. In this research, lengths of PVC tubing of different diameters was used to fill out the fingers of the gloves. 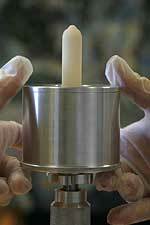 The cylindrical shape of such tubes is not optimal, since the glove fingers are more or less conical in shape. When each finger was rolled, the others were protected by a protective sheath cut from a teflon container (see pictures 32 to 34). 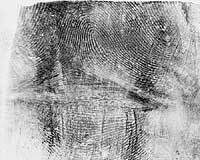 The fingerprints on the strips of black gellifter were photographed using a digital camera, a Nikon D100. The prints were illuminated using white light and a light guide from an alternate light source (ALS) at an angle of about 30 degrees to the lens axis (see picture 36). All pictures were stored in TIFF format, at 18.2 MB. Of course such prints can be photographed with a variety of cameras. 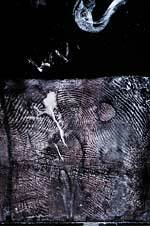 Daniel J. Rinehart, Harris County Sheriff's Department, Houston Texas, "Developing Latent Prints from Gloves", The Print, 1999. Detective Mark Ianni, Criminal Identification Bureau, Edison Township (NJ) Police Dept. 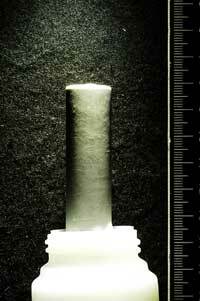 "Developing Latent Prints from Latex Rubber Glove", The Criminalist, Spring 2002. Michael A. Smith, B.A. George Washington University, Washington, DC. Alexandria Police Department, Alexandria, VA. "Latent Fingerprints on Latex Gloves", Development and Photographic Techniques, I.A.I Iowa. Howard A. Speaks, Senor Deputy, Los Angeles County Sheriff's Department, "Ninhydrin Prints from Rubber Gloves" http://www.scafo.org. The Print, June 1999, Vol. 15(3), p. 6. 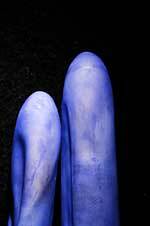 Esther Neate, http://www.eneate.freeserve.co.uk, "Gentian Violet on Latex Gloves". 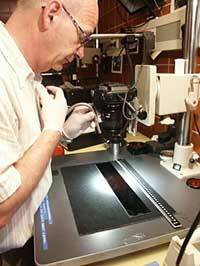 BVDA has undertaken the development of equipment that will make the rolling of the fingerprints easier. The following pictures show the procedure. D. The other parts of the glove are additionally protected by an aluminium case. E. The roller in action, fill out parts for differently sized fingers are depicted in the background.